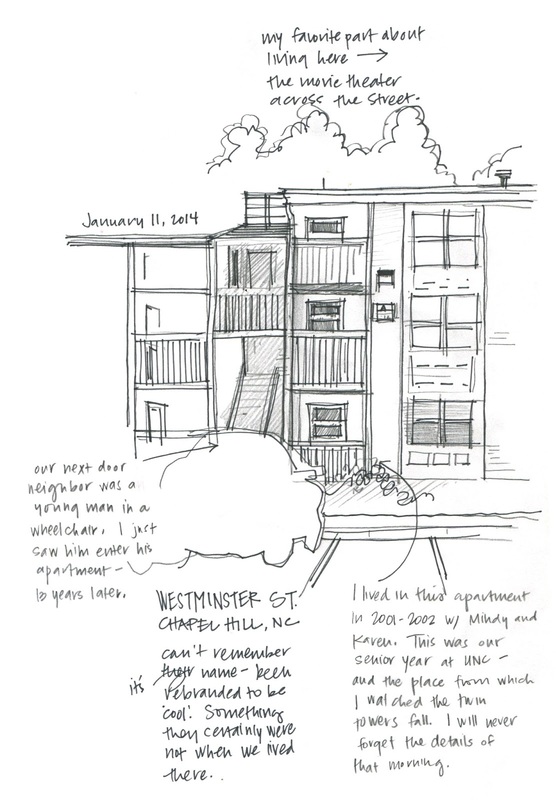 Drove to Wilmington over the weekend---on my way I felt a gravitational pull off the interstate in Chapel Hill and sketch the apartment I shared with two of my friends while we were in college at UNC. It's such a weird feeling to revisit the past, observing how things have changed...and how they have not. I get that statement you made. Last year, I was hired by the school district I attended as a kid. All the same buildings...minus my elementary school because they closed it. All new teachers...but a few familiar names nonetheless...former classmates as adults running the school. Weird. Oh...and someone else living in my childhood home.